Will have a user replaceable magazine? Does it use proprietary .45 caliber ammunition? Is this a grasp at the liberal hippy market? How many times per month will I have to upgrade the software on it? Does it require the newest version of that POS iTunes? What kind of fancy apps can I get for it? Face it. You’ve always wanted to fight with some kind of awesome theme song playing. With the new i1911, you can! Is that a standard rail on the i1911? Next you’re going to tell me it actually shoots .45ACP. Doesn’t sound very Apple to me. hehe yea its gotta be different somehow.. making something to comply with industry standards definitely doesn’t sound like them. I bet it shoots a unique .47 cartridge with identical ballistics, but can’t operate with anything .45! Will it cost 2x or 3x more than another 1911 made with the same parts? I bet the picatinny rail on it is different enough to not allow attachements from other products. I also bet you can’t field strip it either. It will have to be sent in for cleaning. It costs 5 times more than a Glock, is 5 times less intuitive, and uses a proprietary .22 round. Is it designed with “planned obsolescence” in mind, like the iPods? To get serious though, I saw Remington is about to produce a 1911. Iver Johnson is back as well. The design is near 100 years old, and it still sings the song. My choice. Yea that Remington one doesn’t really impress me. I’ll have to look into Iver Johnson, I didn’t know they were back. you can open carry this gun in the cafes and coffee shops.. 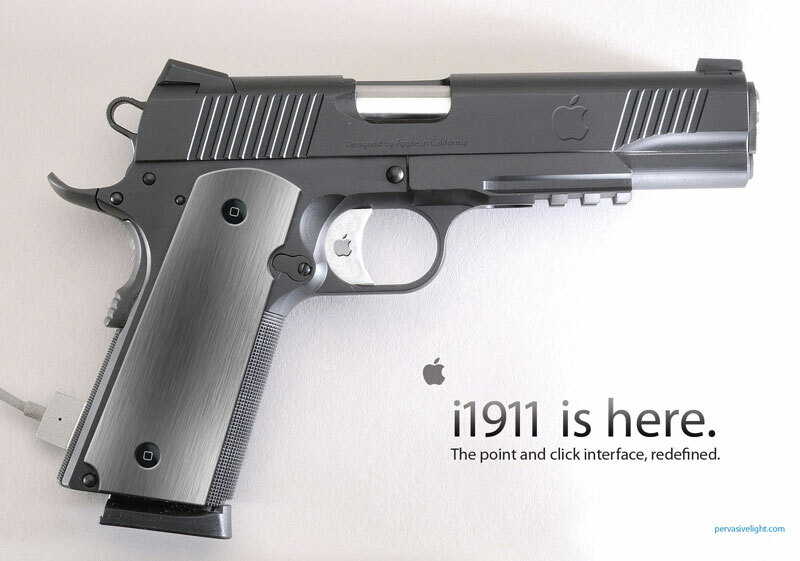 It looks like a 1911, but all of the parts have slightly different dimensions and therefore are proprietary, including the rails, which only take Apple-brand accessories. Fires the 10.5x22mm MAC (MacIntosh Autoloading Cartridge) which is produced only in Silicon Valley — MSRP $129.99 per box of 20. Projectiles are completely lead free (unlike Mac computers). Probably shoots .45 Apple Cartridge, Proprietary. I REALLY WANT TO GET ONE!!!!!!!!!! And today, Griffin Technology announced a new line of holsters, cases, and cheaper magazines. 99 cents per round? And you can only shoot at targets authorized by apple? It would never sell, because it’s impossible to upgrade any hardware in an Apple, and it’s impossible NOT to upgrade the hardware in a 1911 (leaving it stock will send the shooter into convulsions). If Apple really made this the grip screws would be Tri-Wing screws that you’d need a special screw driver to remove. bet its also as slick as a wet bar of soap! I’m headed to the Apple Store right now! Hope they offer it in the iCommander size! I guess the intended market is for poor folks like this guy. I just looked up the video on youtube. That’s brutal! I’m not gonna lie, I would actually really like this being an Apple Fan myself. Just the logo in the trigger and the slide and the color scheme is really appealing to me. I like that clean subtle look.